Silk Scarf Blue White Hand Painted Shawl NEPTUNE DANCING, by Silk Scarves Colorado. Select Your SIZE! Summer Scarf, Birthday Gift, Christmas Gift, Anniversary Gift. Bridesmaid Gift, Valentine Gift. Gift-Wrapped. Elegant Handmade Silk Scarf. Hand Dyed Silk. Handmade in Colorado, USA. 100% silk. 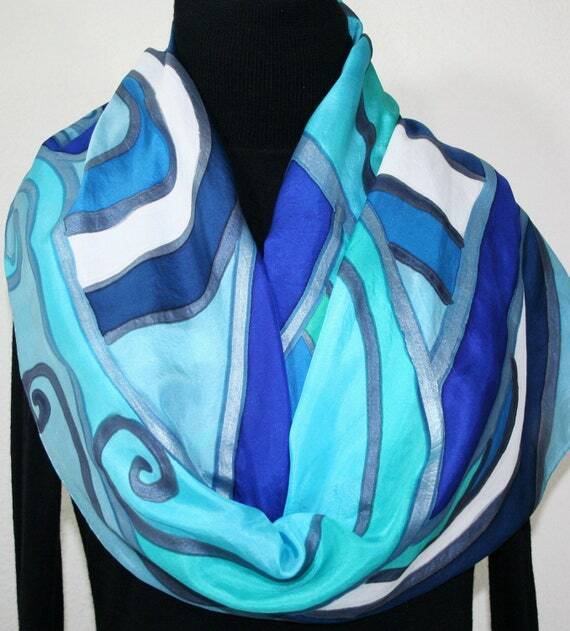 This is a 100% Habotai large-size silk scarf featuring swirly waves in shades of blue - light blue, steel blue, navy blue, turquoise - with some ocean green. Outlines are done in two tones of metallic blue. It is a beautiful, ocean-inspired design that makes a great summer shawl for cooler vacation nights. , by Silk Scarves Colorado. Select Your SIZE! Summer Scarf, Birthday Gift, Christmas Gift, Anniversary Gift. Bridesmaid Gift, Valentine Gift. Gift-Wrapped. Elegant Handmade Silk Scarf. Hand Dyed Silk. Handmade in Colorado, USA. 100% silk. Thank you for visiting Silk Scarves Colorado shop on Etsy!